Chelsea have reached an agreement with Arsenal over an £18million move for striker Olivier Giroud. The two Premier League clubs were locked in talks all day on Tuesday, but a breakthrough has finally been made, with the France international now set to swap The Emirates for Stamford Bridge. However, Giroud still travelled with the Arsenal squad ahead of their clash with Swansea on Tuesday evening and was spotted arriving at the Liberty Stadium along with team-mated Nacho Monreal and Henrikh Mkhitaryan. Talks actually broke down around lunchtime with the Blues walking away from negotiations, Arsenal refusing to accept a deal worth an initial £15m with £5m-worth of add-ons. However, Chelsea came back with a revised bid, with a fee of around £17.6m reportedly agreed between the two clubs. 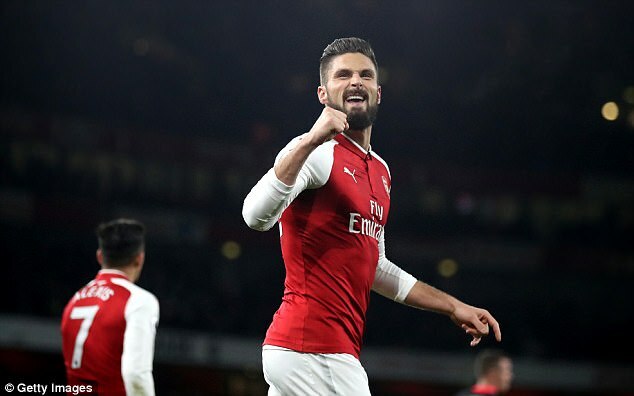 Giroud is set to receive a pay-rise on his current £90,000-a-week contract at the Emirates, while it is thought he will sign an 18-month deal at Stamford Bridge. It is a massive climb down from the north London club, who originally asked £30m for the 31-year-old. However, a pressing need to push through the deal in order to secure the services of Pierre-Emerick Aubameyang from Borussia Dortmund forced their hand. The Bundesliga outfit were unwilling to confirm the move without landing Chelsea striker Michy Batshuayi, a transfer Chelsea refused to sign off on until they landed a replacement. The closing of the Germany transfer window at 5pm on Wednesday, a full seven hours before the English window, further emphasised the need to act swiftly. Chelsea boss Antonio Conte had earlier fumed at the three-way stand off created by the transfer window. Ahead of their clash with Bournemouth, Conte said: 'It is not the best situation to prepare a Premier League game. To have this situation with Batshuayi in the balance is not easy. We don't make excuses, there is no alibi.